Made with raw, sprouted almonds! A flavored almond butter for discerning tastes! Our patient blending of two super-berries from Patagonia and the Andes elevates their sweet and complex flavor perfectly above a creamy almond butter and coconut palm sugar base. Loaded with antioxidants and nutreints these Jems are packed for high adventure. 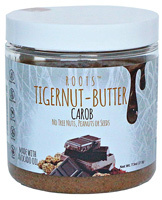 Another outstanding flavored nut butter offering. The key of course being the raw, sprouted almond base.